The V.A.T. exercises you’ll find in this course will start you down the road to a more perfect chest. The chest is the show off muscle. 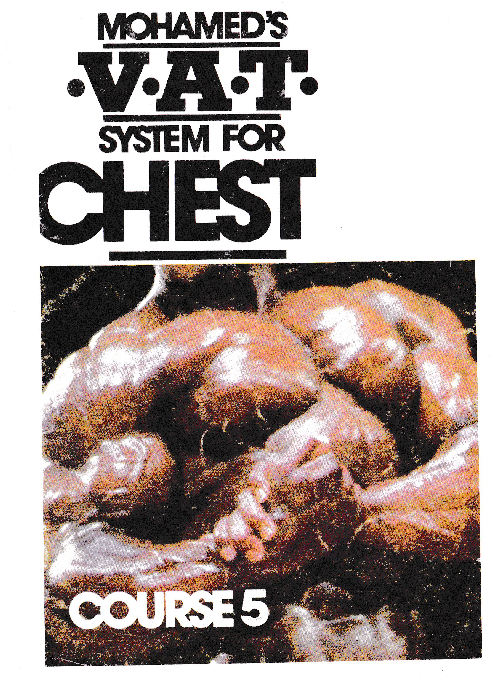 Maximum chest development adds thickness and impressiveness to the whole upper body like nothing else and never fails to bring admiring and envious glances from onlookers, whether male or female. Next to arms, the chest is the most popular muscles to work, and most bodybuilders dream of one day having chests like the top bodybuilding champions. Nearly everyone enjoys chest work as the exercises for the chest are the most comfortable and fun to do. After all, most exercises for the chest are done lying down on a soft cushioned bench! Fully developed, the chest is one of the most impressive and spectacular muscle groups on the male physique, whether under the posing lights or just at the beach in the bright sunlight. Full, thick, well shaped pectoral muscles are the mark of a good bodybuilder and tell the world that you are a bodybuilder, for no other sport or activity develops the chest muscles maximally except bodybuilding. Other athletes can develop through their various sports muscular legs or arms, wide shoulders and well developed backs, but no other kinds of athletes display the thick slabs of muscle on the chest that top bodybuilders do. Thus it seems that everybody is very anxious and in a great hurry to try and get their pees as big as possible as fast as they can. They never stop to worry about shape, definition and if their chests are properly and totally developed and in proportion with the rest of the physique, neglecting the very basic principles of modern bodybuilding. You should always remember that the whole body is one unit and we cannot just have one part developed to it’s maximum and neglect the rest of the body. Our goal in bodybuilding should always be to develop each bodypart to perfection (the right amount of size and the right shape and in proper proportion to other muscles of the body), and not just try to get each muscle as big as we can, for the sake of being big. I’ll explain more on this topic later on into the course. In my approach towards building a complete, perfect, physique, I work hard on total and complete chest development, and not just on building big chest muscles. The V.A.T. exercises you’ll find in this course will start you down the road to a more perfect chest too. As you will soon learn, size is just one of several factors important in building a great chest.